A perfect start - 2initineres Webseite! We get up early and get ready! What beautiful weather is awaiting us! Some foggy spots along the river Reuss animated us to make some pictures. It is a bit cold, but the conditions are perfect. We have been invited for breakfast at our neighbours, but we have not been as hungry as usual, the nervousness started to kick in. From 8.30 am on, friends, family and neighbours started to gather. We definitely have not expected so many people attending the start of our adventure tour. There was a lot of hugging and kissing and of course some emotions before we started at exactly 0900, indicated by a firecracker. 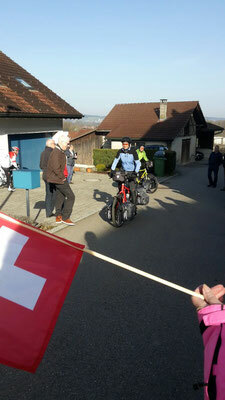 We bike faster than expected, together with Peter that joined us on his racing bike. 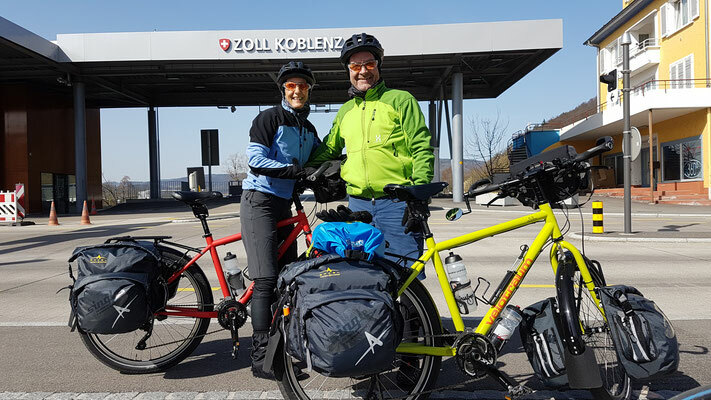 At lunchtime we already arrive at the border at Koblenz / Waldshut, our planned first stop for the night. 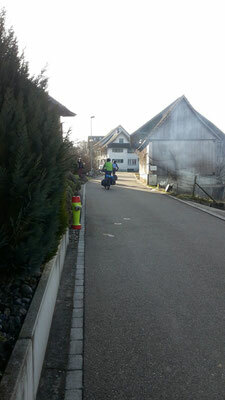 We decide to continue our way to Eggingen and after 79Km we find a nice hotel. Here the next surprise is waiting for us: After an hour of rest the receptionist is calling us, telling that guests are waiting. Philippe, Rela, Peter and Angela managed to find out where we stay! A nice dinner with our friends is topping our first day. Thanks to all that made the day unforgettable for us.